When we mounted the front bumper, we used fender washers to replace the brackets that spanned between each bolt pair. Unfortunately the fender washers, because they are thin, bent and/or cracked when the bolts were tightened down. This morning we went to Menards to get the hardware I needed to finish the heater box and blower housing. Because the receiving nut stripped out, I needed to create a stud in the blower housing that would reach through the firewall so that I could secure the heater box with a nut and washer from the inside. After work today I got out all the parts bins and went through each bag one by one looking for the four screws for the air inlet. I started this morning by cleaning the air inlet. The air inlet goes directly behind the blower motor on the interior side of the firewall. I had forgotten about this piece when I cleaned the rest of the heater box. Here are some pictures for reference. This morning we made a quick trip to Menards and then got started on the sound deadening. The first thing I did was get KITT's interior plastics down. We decided to put the plastics in KITT to see the exact area they will cover, and then sound deaden everything not covered by plastics. It is our intention right now to cover all the backs of the plastics with Ensolite prior to installation. This should achieve the same sound deadening as applying it directly to the RAAMmat BXT II. If that ends up not being the case, we can always still apply it to the areas behind the plastics. This morning we pushed KITT to the end of the garage so we could clean the engine bay without getting water all over the garage. The parts I ordered for the heater box and blower housing arrived this week. I needed to compare them to make sure everything looked right. Here are pictures of new versus old. 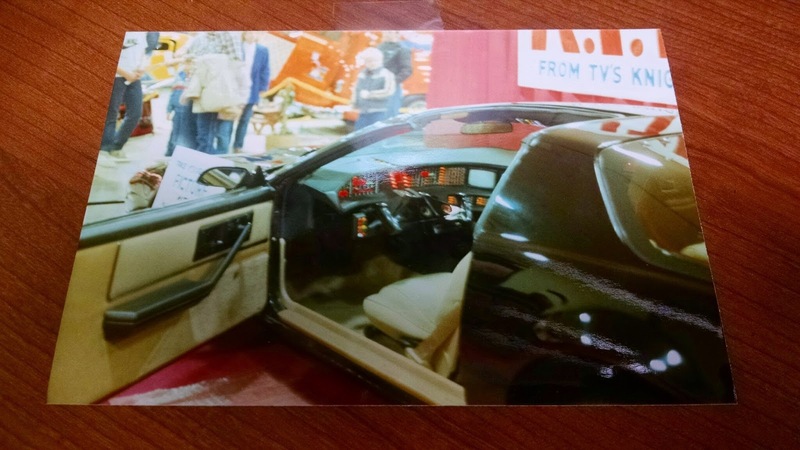 One of my coworkers brought me this picture from a car show he had attended in the 90s. He had the opportunity to see a screen used KITT. He said I could have the picture, so I hung it up in my office. Thanks Gary! On Saturday afternoon, Sara attended a bridal shower, and I tackled dismantling and cleaning the heater box. One of the things I have discovered while looking back through my blog for reference pictures is that I did not take enough pictures. I have had trouble finding pictures of certain parts, fitment, sides, angles, etc. I have decided I cannot take too many pictures of this project, hence all the pictures of the heater box in this post. This is all four sides of the heater box before I got started Saturday afternoon. Today we mounted the fenders! Up until now they have just been hanging on the frame of the car. First we located all the hardware for the fenders.